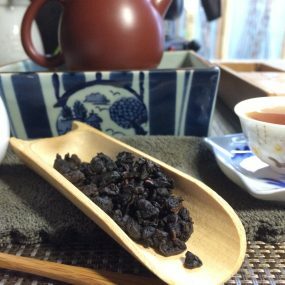 Blue teas, known as oolong or wu long or ‘black dragon’ teas, combine the fresh flavour and aromatic quality of green tea with the smooth body and rich, dark roastiness of black tea. Fine oolongs are produced in Taiwan and mainland China, with the former tending to be lighter in colour and flavour. Oolongs comprise a broad range of flavour and aromatic profiles, having undergone partial enzymatic oxidation, from 20% oxidised to 80%. 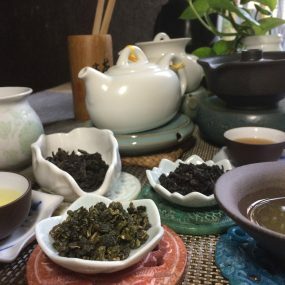 This great variety of taste profiles also arises because oolong tea may come from many sub-species of the ‘camellia sinensis’ tea bush and be grown in many diverse soil, altitude and weather conditions. Besides that, the tea will often be infused several times, with each re-brew bringing different flavours and aromas to the fore. Oolongs are often hand-rolled into the form of tight pellets, which open and unfold on brewing. Generally this group of teas is incredibly fragrant, whether lightly floral or with deep caramel tones. 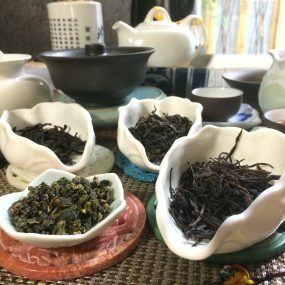 The dark, rich oolong leaves, when brewed, produce a liquor that runs from yellow or a pale brown at one end of the spectrum to bright green. Chinese tea drinkers often compare the flavour of oolong teas to ripe fruit, such as peaches and plums. Some astringency is prized, as well as the ticklish and sweet aftertaste that lingers at the back of your mouth and throat after tasting the tea, a sensation called hou yun or ‘throat resonance’. If you’d like to learn more about appreciating the finer nuances of oolong teas, differentiating like a true connoisseur among amazing, floral teas as well as gorgeous, fruitier varieties, come along to our masterclass ‘Discover the World of Black Dragons’! The craggy slopes of Wuyi Mountain in Fujian province are where oolongs were first created. Using time-honoured methods the leaves are sun-withered, bruised then oxidized to a high level, and finally roasted over charcoal. This produces the tea’s dark, twisted appearance and rich, roasted flavour with its characteristic notes of burnt sugar, cocoa, fruit and spice. The sub-tropical climate and rich soil of mountainous Anxi in Fujian produce the distinctive dark, thick, glossy, serrated leaves of the Iron Goddess of Mercy oolong tea bush. This is a lovely oolong, intensely flavourful and aromatic, with notes of ranging from florals, stone-fruits, honey and nuts. 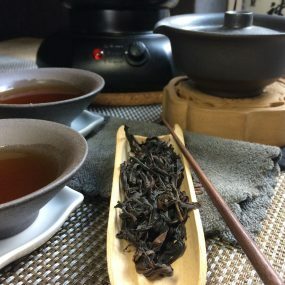 Phoenix Single Bush or Single Grove (‘Dan Cong’) is a fascinating oolong category. Each varietal traces its DNA directly, via many generations of careful selective breeding, back to one of 18 venerable ‘mother’ bushes. These ancient bushes continue to thrive after a thousand years on the slopes of Wudong Shan, over 1100 meters above sea level. This forms part of the Phoenix mountain range (Fenghuang Shan) in China’s eastern Guangdong province. Formosa oolongs typically exude a distinctive, floral ‘green fragrance’ (qing xiang) which is a result of low oxidation.